One topic that I have great interest is how we solidify our knowledge and most importantly, how we can retrieve it. The Zettelkasten uses a unique approach to keep and build new relationships between a myriad of information, but, can the Zettelkasten be used to help us learn more efficiently? 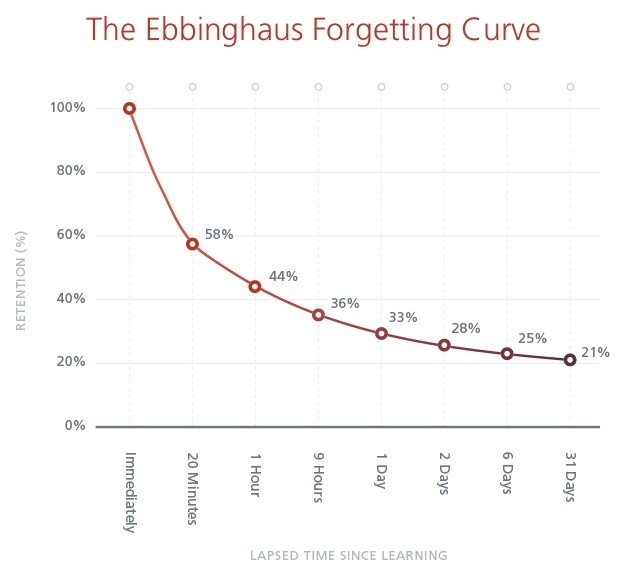 There is a concept created by Hermann Ebbinghaus[^https://en.wikipedia.org/wiki/Forgetting_curve] called the Forgetting Curve, which hypothesizes the decline of memory retention in time. Further research identified that the studies conduct by Mr. Ebbinghaus were pretty accurate. how the hell this relates to the Zettelkasten Method and The Archive? According to Ebbinghaus, and in order to achieve maximum retention of what we have learned, we need to revisit our Zettel / Mindmap or Flash Card following the optimum intervals, given by a formula. Based on my experience, my optimum recall is 24 hours, 3 days, 7 days, 14 days, 21 days and 28 days. And from there is unlikely that I'll forget. So, with all that said, the idea here is to create a specific tag for a Zettel that you would like to revisit, something like #1&&, #3&&, #7&& .. you got the point. So you can recall your Zettels and change the tag to the next one. If you think you still have difficulties, just keep it with the same tag. It's important to keep track of how often you revisit the information. If you are feeling lazy, you can copy and paste your Zettel on a specialized software, like (Anki)[https://apps.ankiweb.net/] and keep track from there. I would like to see something like Anki natively implemented in TA, maybe using scripts. I know Anki and think it's a great tool: during my years as a student advisor at University, I found that automating the revisiting periods helped students keep on track for large volumes of information. The method works well. Whenever I recommended working with a (mostly project-based) Zettelkasten, though, the mere act of playing with the material and creating custom structures already improved retention, though through a different mechanism, I suppose: You have to work with the content at a deeper level to do this kind of work, much different from mere memorization. It's rote memorization VS understanding, I'd say. What kind of notes do you want to revisit in order to commit their content to memory? A Zettelkasten shines when you organize knowledge and facilitate this kind of creative knowledge work; it's not optimized to store vocabulary cards or definitions, although it doesn't care if you put these into the archive, too. While I don't think that this is a feature that e.g. The Archive should support out-of-the-box, it should be pretty easy to write scripts for that that operate in the same directory! The tags will have to become key--value tuples to properly encode when the X days are up, like #3&&(2017-10-17) or #memorize:3:2017-10-17 or whatever to signify that "in 3 days" means "2017-10-17". This is a cool idea. I wouldn't do it any different if I'd use the archive for that kind of stuff. However, I don't believe so much in the power of repetition than in the power of understanding. Instead, I utilise the levels-of-processing effect. There is good research on chess players who utilise their longterm memory in conjunction with their working memory. (1) This is not only by repetition possible but on how you repeat it. With these card learning tools you tackle the same knowledge token from the same angle over and over again. To increase the level of processing you should attack it from multiple angles. That means: Understand it, draw implications, embed it into larger models,... in short: work with it. 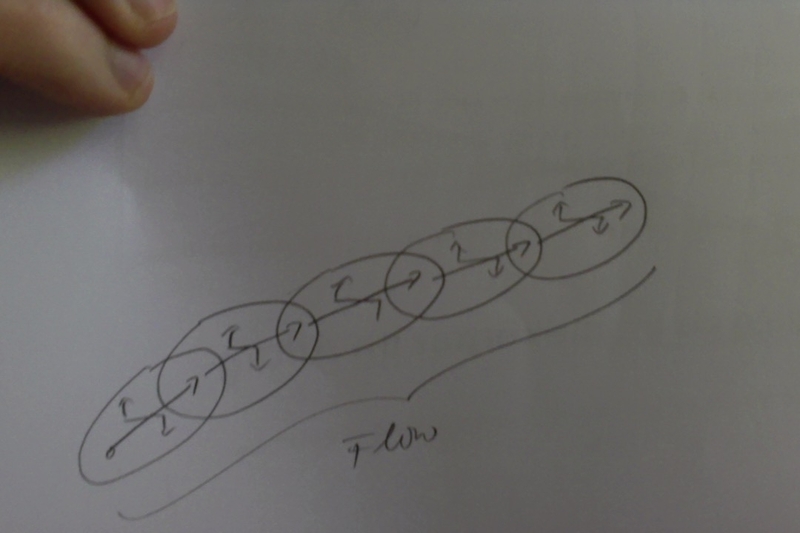 For this reasons I utilise drawing by hand when I think about connections in my archive. I often end up with some drawing that will be stored in my archive as an additional visual representation. There is some evidence that even engaging in different motor tasks (writing on hand vs. typing) increases comprehension. O Amidzic, H J Riehle, T Fehr, C Wienbruch, and T Elbert (2001): Pattern of focal gamma-bursts in chess players, Nature 6847, 2001, Vol. 412, S. 603. Guillermo Campitelli, Fernand Gobet, Kay Head, Mark Buckley, and Amanda Parker (2007): Brain localization of memory chunks in chessplayers, Int J Neurosci 12, 2007, Vol. 117, S. 1641-59. Hartmut Freyhof, Hans Gruber, and Albert Ziegler (1992): Expertise and hierarchical knowledge representation in chess, Psychological Research 1, 1992, Vol. 54, S. 32--37. Pam A. Mueller and Daniel M. Oppenheimer (2014): The Pen Is Mightier Than the Keyboard, Psychological Science 6, 2014, Vol. 25, S. 1159-1168. I have often wondered if a physical zettelkasten would not be preferable for this reason? Handwriting and being able to hold the cards as well as the uniqueness of each card. Physical cards are unique to look at, but digital ones more-or-less identical. I also love being able to spread the cards out over the floor and read them. Try that on a computer! You cannot beat paper when it comes to retention. Every coffee stain can serve as an anchor to help remember a note's Gestalt and content. Pirsig also talks about the advantage of being able to physically sort his note slips in Lila. Even if he's not ready to assemble them into a complete structure, at the very least he can always pick up two slips and decide "which comes first". I think spaced repetiton/Anki for notes from a zettelkasten are dismissed prematurely here. I'm not sure if the following idea would be good in practice but I would be interested in some real world feedback. I will try this out over the coming months. I think using some form of spaced repetition might be very useful for some notes: Reviewing all notes is probably too much but maybe some kind of review for a substantial portion (maybe 1/3 ???) might be beneficial. The goal should not be to remember all the details from a card but just to remember vaguely that you have a card about this. Admittedly Anki is most popular for learning vocabulary and learning vocabulary is about connecting arbitrary pieces of information (at least I don't see the reason why these furry four legged animals are called "dogs" in English, "Hund" in German, and "chien" in French). But that's only one area of using Anki. You can use Anki for learning "real" topics that require understanding like maths. I think there's a good chance that people who get good grades in their university degree in maths "understood" what they were doing. Nevertheless after a short time they have forgotten a lot. So understanding doesn't prevent you from forgetting - at least that's the reports I get from the few people I know who studied mathematics and that's what I find in the few articles about maths and forgetting on the internet and the benefits of using Anki for maths. And this fits with the general pattern about knowledge in all other disciplines. People who had really good grades in school and university in certain subjects forget most of the stuff even though they had real understanding instead of facts they just crammed for an exam. Reviewing many cards can take some time. So maybe the opportunity cost of reviewing is too high. Creating cards can take a long time. So maybe the opportunity cost of creating cards is too high. How well you use the zettelkasten: Do you search it enough? Do your cards contain enough links? Can you set tags the right way? Having a vague idea of many notes in your head might compensate for shortcomings of your technique. People who use a zettelkasten only for a thesis might not have the benefit of adjusting their technique over the years so some form of spaced repetition might be a safety layer/parachute/reassurance. The fact that a zettelkasten is digital makes finding cards that are due to review much faster. The wide availability of smartphones or tablets allows to review during times that otherwise would be dead/lost: There are many times during the day when you have small windows of a couple of windows that would otherwise be dead/lost like waiting for/riding the bus for 3 minutes, waiting for other people if you arrive a couple of minutes early, ... You might argue that you need some down time to get good ideas but I think this works much better if you don't get distractons like during a long walk in the woods. Many people already use smartphones during these times but mainly for facebook. Instead of facebook some people scroll through their rss-feeds or articles they saved in getpocket.com. But I guess that even the latter group would probably benefit more from reviewing notes (that are the result of dealing with books) than skimmming online articles/news. Most newspaper information is quickly dated (politics, technical infos), too shallow (the ultimate diet/exercise/feel-good techniques, etc. ), etc. So the opportunity cost for reviewing some cards shouldn't be too high. Creating cards can be automated: Every heading has an ID that can be used to identify this card in Anki. So you can batch import all cards and update them later without losing your progress/ratings (see https://apps.ankiweb.net/docs/manual.html#duplicates-and-updating) or you could write a script that allows you to send a note to Anki with the Anki Connect addon. Instead of importing all notes or only importing notes manually you could also use a special tag so that your script imports only these cards. You remember much better if you actively try to remember instead of just passivly viewing the content. So you might want to import your notes to the back of your flash card and add a question. You could add such a question during the first review or you could add an optional special field to your note that contains a question. I think that could only be solved with trial and error.